Everyone has some degree of body odor, but it’s fairly unnoticeable to both ourselves and the ones around us if proper hygiene is maintained. However, what you eat and don’t eat affects your natural body odor. Some foods improve it such as greens or fruits, others cause or worsen it such as red meat, eggs, coffee or spices. 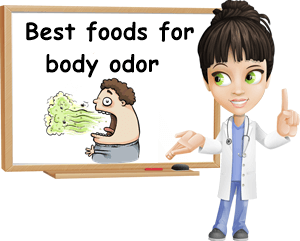 And in order to maintain a fairly pleasant scent that is not in any way upsetting for those around us or ourselves, we must learn which foods cause and which foods eliminate body odor. Of course, no two people are exactly the same so foods that may cause an unpleasant body odor in some of us may not necessarily do the same for others. Just as important, some people have medical conditions that make them susceptible to bad body odor from a wider range of foods. 1) Cruciferous vegetables. Broccoli, cabbage, cauliflower, Brussels sprouts, bok choy or Chinese cabbage all contain choline, a vitamin B-like nutrient. Gut bacteria turn choline into a compound called trimethylamine. But some people have a genetic disorder that causes them to not be able to metabolize trimethylamine well so it accumulates in the body, resulting in a bad body odor. The condition is known as fish odor syndrome and causes breath, sweat and other fluids acquire a fish-like smell, sometimes an ammonia odor. Eating foods rich in choline such as cruciferous vegetables amplifies this smell. Cruciferous vegetables contain sulfur compounds which further contribute to the problem if eaten in excess. 2) Garlic. Probably the most well known food that causes body odor, garlic is responsible not only for bad breath, but also for garlic body smell. Eating several cloves of fresh garlic a day for several days in a row can cause sweat to smell like garlic or ammonia or have a medicinal smell to it which then causes the whole skin to acquire the bad odor. The odor is a result of the body breaking down organic sulfur compounds that give garlic its specific flavor (like allicin) and massively eliminating them through sweat. Some people can smell this on themselves, while others can’t and only find out about it when other’s tell them. While harmless, garlic body odor can be mistaken for bad odor caused by liver damage, for example, or an infection. The best way to improve body odor caused by eating garlic is to stop eating it and wait for the body to eliminate all of its aromatic compounds naturally. 3) Onions, shallots, scallions, chives and leek. All vegetables in the onion family contain organic sulfur compounds that give them their specific flavors. These compounds are metabolized and then eliminated primarily through sweat, causing bad body odor emanating through the pores of the skin. The more onions, scallions or leek you eat, the stronger the odor. 4) Eggs, red meat, white meat, fish and seafood. Beef and pork, turkey, chicken, innards (liver, gizzards), fish (cod, herring, mackerel, swordfish, trout), mollusks (mussels, oysters, octopus), luncheon meats (sausage, salami, ham) and eggs, particularly duck eggs and goose eggs and egg yolks more than egg whites are some of the best dietary sources of choline and carnitine. This makes them the worst foods to eat for body odor for people with fish odor syndrome. 5) Milk, sweet dried whey and whey protein powder and dairy (cottage cheese, Swiss cheese, ricotta, feta, yogurt). Also high in choline and carnitine, these foods worsen fish odor syndrome and cause bad body smell. They are best eaten in limited amounts if you want to have less body odor. 6) High-protein beans, nuts and seeds. Soybeans, soy-based protein powder and other products, tofu, edamame, beans, lima beans, peas, almonds, hazelnuts, peanuts, sunflower and pumpkin seed kernels have a relatively high content of choline and can worsen fish odor syndrome and body smell. Sunflower seeds, soybeans as well as milk and eggs are also sources of lecithin which causes fish odor in people with fish odor syndrome. 7) High-protein foods for maple syrup syndrome. Meat, eggs, dairy, nuts, seeds, legumes, soy, whole grains, avocado, seaweed, algae and protein powders are responsible for a maple syrup odor in people with an inherited condition that makes them unable to properly synthesize three amino acids (components of protein): leucine, isoleucine and valine. Eating these foods in excess causes the amino acids to build up, resulting in toxicity. A sweet, maple syrup smell to urine or sweet smelling ear wax are signs of the condition. It’s recommended to see a doctor as soon as possible if you notice these symptoms. 8) Fenugreek and asparagus. Eating fenugreek seeds causes a sweet, maple syrup or fenugreek-like smell to body fluids. Asparagusic acid in asparagus is broken down in sulfur compounds which are responsible for a bad, sulfur-like smell to body fluids. This smell is temporary and can be prevented by avoiding the vegetable. However, not all people eating asparagus develop this smell. 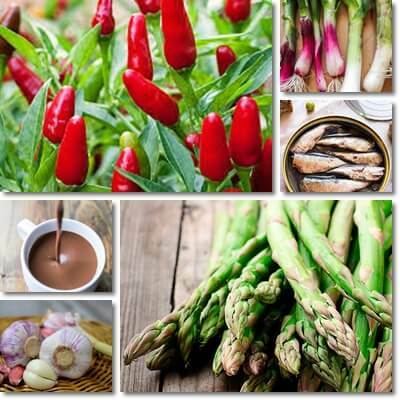 Asparagus is a source of carnitine which means it should be avoided by anyone with fish odor syndrome. 9) Spices: wasabi, hot peppers, horseradish, mustard, pepper, turmeric. Spices are foods to avoid for body odor because they raise body temperature and cause sweating. A high intake leading to excess sweating increases the chances of a bad body smell. The effect is proportional to the amount of spices eaten and is worse in people with an existing condition that predisposes to excess sweating and body odor such as hyperhidrosis. Also read about the 7 side effects of hot chili peppers. 10) Coffee, caffeinated beverages (green tea, black tea), soft drinks (fizzy drinks) and alcohol. Coffee and, to a certain extent, caffeinated beverages can cause a coffee or acrid body odor. The odor is more noticeable if you don’t drink enough water to dilute the flavor-giving compounds in coffee. Not upping water intake when you drink more than 1 small coffee a day and not brushing teeth afterwards can also cause a stale smell to breath. Soft drinks dehydrate which can lead to bad breath and bad body odor. Alcohol has a warming effect and causes sweating, which feeds bacteria living naturally on the skin and contributes to growing populations and bad smell. Read more about body odor: causes and treatment. 1) Fresh fruits. A healthy intake of fresh fruits can significantly improve body odor over the course of a few weeks. However, it should be accompanied by a healthy intake of water and an overall clean diet, with no processed foods and more plant-based foods than animal-based foods. 3) Egg whites instead of whole eggs. Egg whites are a good choice for getting your protein and eliminating body odor if you have fish body odor. This is because all nutrients, including choline, are found in the yolk, making it the source of bad smell. Eating only the egg white can help prevent and reduce body odor. 4) Foods rich in vitamin C. Vitamin C is a natural detoxifying agent and can help improve body odor. Eating fresh bell peppers, kiwifruit, strawberries, rose hip, guava or, if available, acerola cherry, camu camu and kakadu plum are great foods that can help change body odor for the better. 5) Drinking less coffee and, at the same time, upping water intake can help dilute any bad smells. 6) Maintaining a predominantly vegetarian diet with more plant-based foods than animal foods can result in better body odor. 7) Increasing fiber intake from fruits and vegetables and other fiber-rich foods improves body odor. Fiber regulates transit time and digestion, exerting a detoxifying effect. 1) Eating a clean, natural diet and excluding all forms of processed food. 2) Preventing nutritional deficiencies with dietary variety and supplementation. 3) Seeing a doctor for a personalized diet for body odor caused by specific conditions. 4) Sun exposure could help in the long term because it produces vitamin D.
Just make sure you take a shower after to combat any bad smell from excess sweating. 5) Exfoliating skin with natural products such as sugar and adding herbs or essential oils such as chamomile, eucalyptus and other mentholated essential oils etc. to bath water can potentially help reduce bacteria numbers on skin which cause body odor and provide a refreshed scent. However, remember to check for allergies first.